Let the river guide you to fresh-caught fish, fields of lavender and hidden chanterelles. Here are a few of our favorite stops along the McKenzie River portion of the South Willamette Valley Food Trail. Start your day with coffee and a slice of pie at 100 Mile Bakery, where ingredients are sourced within 100 miles. Grab an extra biscuit with jam for the road (you&apos;ll thank us!). Schedule a half-day or full-day fishing trip on the McKenzie River with A. Helfrich Outfitter to catch trout, salmon or steelhead. Full-day trips enjoy a delicious riverside fish fry lunch that can also be pre-arranged for half-day trips. Make a stop at Herrick Farms and Organic Redneck Growers. These farm stands offer an array of farm fresh produce and seasonal u-pick opportunities, May through December. Continue upriver to McKenzie River Lavender, with fields framed by hazelnut orchards. Call ahead for private tours and special craft classes - and don’t miss the Lavender Festival in July! Finish up your day at McKenzie General Store. Enjoy a local craft beer or glass of Willamette Valley wine with dinner made from organic local foods. Looking for a place to stay nearby? Check out riverfront Eagle Rock Lodge, where all meals and snacks are homemade and sourced from as many local ingredients as possible. 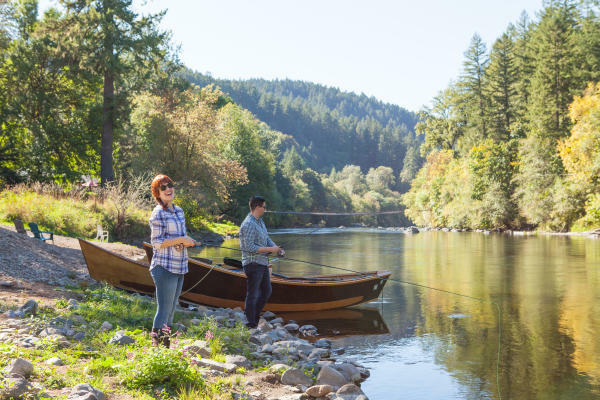 "A River Runs Through It" McKenzie River Tour is one of three suggested itineraries that make up the South Willamette Valley Food Trail. Produced by the South Willamette Valley Culinary & Agritourism Studio, this project is the fourth iteration of Travel Oregon’s Oregon Food Trails. The South Willamette Valley Food Trail will be available in April as a printable and downloadable guide to Oregon&apos;s delicious culinary and agritourism experiences.